This book authoritatively articulates the governing principles of criminal law, and features a clear and comprehensive analysis of every offense in the Criminal Code and the Controlled Drugs and Substances Act. 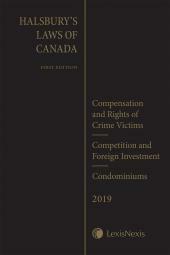 Canada's premier treatise on criminal law has been thoroughly revised and updated once again. Written by defence counsel Morris Manning, Q.C. 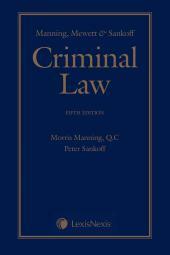 and Professor Peter Sankoff, Manning, Mewett & Sankoff – Criminal Law, 5th Edition provides an updated, detailed and critical examination of the criminal law of Canada, from the governing principles of criminal law, to a clear and comprehensive analysis of important offences in the Criminal Code and the Controlled Drugs and Substances Act as well as defences. 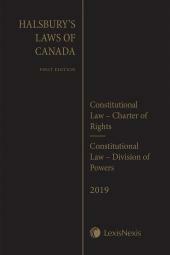 Previous editions of this text have been cited repeatedly by the courts at every level including the Supreme Court of Canada and every appellate court. The text facilitates efficient and focused legal research for practitioners, providing them a foundation upon which to build cogent legal argument. The text also provides the judiciary with a comprehensive reference of the existing criminal law and enables them to consider where new developments might be desirable. Thus, it is an essential resource for Crown and defence counsel, the judiciary, academics and students alike. The new edition has been thoroughly revised to account for the many major developments in criminal law that have occurred since the publication of the previous edition in 2009, including a variety of new offences that did not exist at that time. Similarly, the new edition also provides in-depth expert analysis on the significant changes to criminal law defences which have emerged during the same period, including the new "streamlined" self-defence regime and the Supreme Court's revisiting of the "air of reality" test. In light of the 2013 reforms, when do the various types of self-defence of the person apply? The definition of the proper scope of sexual assault and the defence of honest belief in consent. Updated analysis of the Canadian Charter of Rights and Freedoms' limitation on criminal law, including discussion of Supreme Court of Canada cases such as R. v. Khawaja, Canada (Attorney-General) v. Bedford and Carter v. Canada (Attorney General). Morris Manning, Q.C., C.S., J.D., was appointed Senior Crown Counsel in 1973 and Queen's Counsel in 1978. As Counsel in the criminal law field, he prosecuted in the trial courts and acted in appeals before all levels of court. As a Certified Specialist in criminal litigation by the Law Society of Upper Canada, he has acted as Defence Counsel at all levels of court. Mr. Manning, Q.C., has appeared before the Supreme Court of Canada on more than 100 occasions. He has been an editor of several Canadian law reports and has authored three criminal law texts, including The Protection of Privacy Act – An Analysis and Commentary (Butterworths), Wiretap Law in Canada (Butterworths), and Rights, Freedoms and the Courts: A Practical Analysis of the Constitution Act 1982 (Emond/Montgomery). Together with the late Professor Alan Mewett, he co-authored the first Canadian text on criminal law, of which this is the fifth edition. Peter Sankoff, B.A., J.D., LL.M., is a Senior Lecturer at the University of Auckland (New Zealand), Faculty of Law, teaching in the areas of criminal law, evidence, and animal law since 2001. Mr. Sankoff was a law clerk for The Honourable Madame Justice Claire L'Heureux-Dubé at the Supreme Court of Canada. Between 1999 and 2001 he worked for the Canadian federal government as an advisor on human rights matters involving criminal justice. Mr. Sankoff is the Co-Author of Witnesses, a treatise on the substantive, evidentiary, and procedural laws relating to witnesses, the Portable Guide to Witnesses and numerous articles on human rights, criminal procedure, animal law, and evidence.